M.A. (Hons., Edinburgh), LL.B., Ph.D. (History, Dalhousie), of the Ontario Bar. Jim Phillips is Professor of Law, History and Criminology at the University of Toronto, and editor-in-chief of the Osgoode Society for Canadian Legal History. He was law clerk to Madame Justice Bertha Wilson of the Supreme Court of Canada (1987-1988) before joining the University of Toronto. He has published numerous articles on British imperial history and eighteenth century India, on property and charities law, US legal history, and, principally, Canadian legal history. 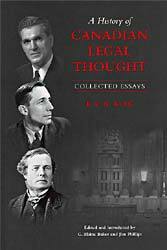 He has co-edited four volumes of the Osgoode Society for Canadian Legal History’s Essays in the History of Canadian Law and, with Philip Girard and Barry Cahill, a volume on the history of Canada’s oldest surviving superior common law court, the Supreme Court of Nova Scotia. 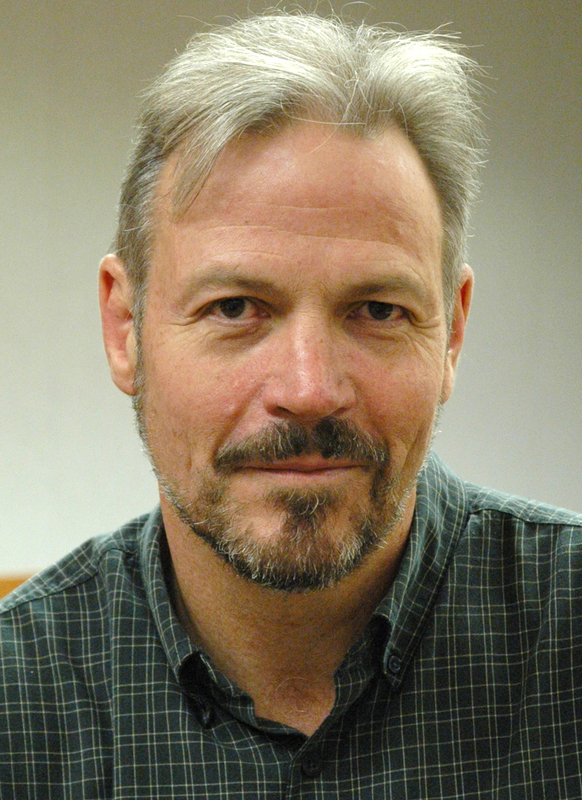 He was the winner of the Mewett Award for Teaching Excellence in 2001, the MacLean Lecturer in Legal History at the University of Victoria in 2002, the Salmond Lecturer at the Victoria University of Wellington, New Zealand, in 2010 and in 2014 he was awarded the Mundell Medal for excellence in legal writing. 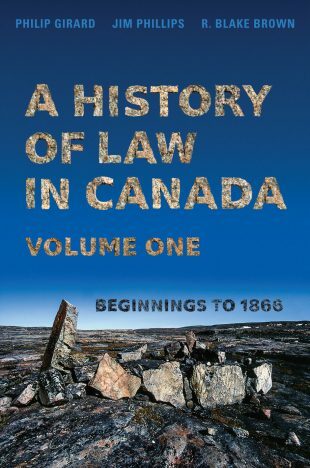 Essays in the History of Canadian Law: Volume Five – Crime and Criminal Justice (Toronto: The Osgoode Society and University of Toronto Press, 1994), 583 pp. (editor with Tina Loo and Susan Lewthwaite.) Second edition printed in 2008. 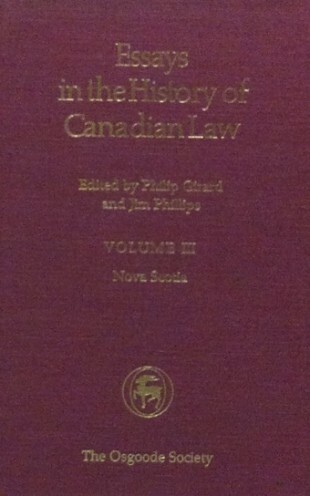 Essays in the History of Canadian Law: Volume Three – Nova Scotia (Toronto: The Osgoode Society and University of Toronto Press, 1990), 369 pp. (editor with Philip Girard). ‘Manitoba Fisheries v. The Queen: The Origins of Canada’s De Facto Expropriation Doctrine’ in Bruce Ziff, Eric Tucker, and James Muir, eds., Property on Trial: Canadian Cases in Context (Toronto: The Osgoode Society and Irwin Law, 2012), pp. 257-299 (with Jeremy Martin). ‘A Certain Mallaise: Harrison v. Carswell, Shopping Centre Picketing, and the Limits of the Postwar Settlement’ in Judy Fudge and Eric Tucker, eds., Work on Trial: Canadian Labour Law Struggles (Toronto: The Osgoode Society and Irwin Law, 2010), pp. 241-280 (with Philip Girard). 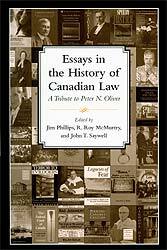 ‘Introduction: Peter Oliver and the Osgoode Society for Canadian Legal History’ in Jim Phillips, R. Roy McMurtry and Jack Saywell, eds., Essays in the History of Canadian Law: Volume 10 – A Tribute to Peter Oliver (Toronto: The Osgoode Society and University of Toronto Press, 2008), pp. 1-30 (with R. Roy McMurtry and Jack Saywell). ‘High Above The Generality of The People: The Origins of the Nova Scotia Supreme Court Circuit’ in above, pp. 200-221. ‘Courts, Communities, and Communication: The Nova Scotia Supreme Court on Circuit, 1816-1850′ in Hamar Foster, Andrew Buck, and Ben Berger, eds., The Grand Experiment: Law and Legal Culture in British Settler Societies (Vancouver: The Osgoode Society and University of British Columbia Press, 2008), pp. 117-134 (with Philip Girard). ‘Introduction’ in A History of Canadian Legal Thought: Collected Essays of R.C.B. Risk, eds. G. B. Baker and J. Phillips (Toronto: The Osgoode Society and University of Toronto Press, 2006), pp. 3 – 29 (with G. Blaine Baker). ‘Origins to Confederation: The Supreme Court, 1754-1867′ in Philip Girard, Jim Phillips, and J. Barry Cahill, eds., The Supreme Court of Nova Scotia 1754-2004: From Imperial Bastion to Provincial Oracle (Toronto: The Osgoode Society and University of Toronto Press, 2004), pp. 53 – 139 (with J. Barry Cahill). ‘The Criminal Trial in Nova Scotia, 1749-1815′ in G. Blaine Baker and Jim Phillips, eds., Essays in the History of Canadian Law: Volume Eight – In Honour of R.C.B. Risk (Toronto: The Osgoode Society and University of Toronto Press, 1999), pp. 469-511. ‘Rebellion and Repression in Nova Scotia in the Era of the American Revolution’ in F. Murray Greenwood and J. Barry Wright, eds., Canadian State Trials: Volume One – Law, Politics and Security Measures, 1608-1837 (Toronto: The Osgoode Society and University of Toronto Press, 1997), pp. 172-220 (with Ernest Clarke). 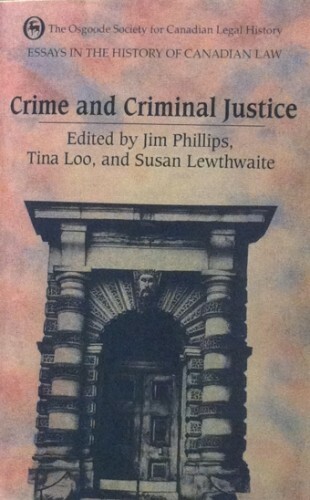 ‘Women, Crime and Criminal Justice in Early Halifax, 1750-1800′ in Jim Phillips, Tina Loo, and Susan Lewthwaite, eds., Essays in the History of Canadian Law: Volume Five – Crime and Criminal Justice (Toronto: The Osgoode Society and University of Toronto Press, 1994), pp. 174-206. ‘Introduction’ in above, pp. 3-16 (with Tina Loo and Susan Lewthwaite). ‘Poverty, Unemployment and the Criminal Law: The Administration of the Vagrancy Laws in Halifax, 1864-1890′ in Philip Girard and Jim Phillips, eds., Essays in the History of Canadian Law: Volume Three – Nova Scotia (Toronto: The Osgoode Society and University of Toronto Press, 1990), pp. 128-162. ‘Introduction’ in above, pp. 3-9 (with Philip Girard). ‘The Many Meanings of Judicial Independence: Examples from British North America,’ Law in Context, vol 33, 2015, pp. 1 – 16. ‘Too Many Courts and Too Much Law: The Politics of Judicial Reform in Nova Scotia, 1830-1841′ Law and History Review, Vol 30, 2012, pp. 1 – 45 (with Bradley Miller). 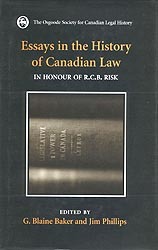 ‘Rethinking “The Nation” in National Legal History: A Canadian Perspective’ Law and History Review, Vol 29, 2011, pp. 607-626 (with Philip Girard). ‘Why Legal History Matters’ Victoria University of Wellington Law Review, Vol 41, 2010, pp. 293-316. ‘The Court and the Legal Profession: Loyalist Lawyers and the Nova Scotia Supreme Court in the 1780s’ in Constance Backhouse and Wesley Pue, eds., The Promise and Perils of Law: Lawyers in Canadian History (Toronto: Irwin Law, 2009), pp. 161-172. ‘Albion’s Empire: Property, Authority and the Criminal Law in Eighteenth-Century Canada’ Australian Journal of Legal History, Vol 10, 2006, pp. 21-29. Murdering Holiness: The Trials of Franz Creffield and George Mitchell (Vancouver: University of British Columbia Press, 2003), 347 pp. (with Rosemary Gartner). ‘Incarcerating Holiness: Religious Enthusiasm and the Law in Oregon, 1904′ in Constance Backhouse and Jonathan Swainger, eds., People and Place: Historical Influences on Legal Culture (Vancouver: University of British Columbia Press, 2003), pp. 170 – 197 (with Rosemary Gartner and Kelly De Luca). ‘The Creffield-Mitchell Case, Seattle 1906: The Unwritten Law in the Pacific Northwest’ Pacific Northwest Quarterly, Vol 94, 2003, pp. 69-82 (with Rosemary Gartner). ‘The Criminality of Women in Eighteenth-Century Halifax’ Acadiensis, Vol 31, 2002, pp. 71-97 (with Allyson May). ‘Homicide in Nova Scotia, 1749-1815′ Canadian Historical Review, Vol 82, 2001, pp. 625-661 (with Allyson May). Reproduced in Chris McCormick and Les Green, eds., Crime and Deviance in Canada: Historical Perspectives (Toronto: Canadian Scholars Press, 2005), pp. 87 – 106. ‘ “The Course of Law Cannot Be Stopped:” The Aftermath of the Cumberland Rebellion in the Civil Courts of Nova Scotia, 1778-1808′ Dalhousie Law Journal, Vol 21, 1998, pp. 440-474 (with Ernest Clarke). ‘Halifax Juries in the Eighteenth Century’ in Greg Smith, Allyson May, and Simon Devereaux, eds., Criminal Justice in the Old World and the New: Essays in Honour of John M. Beattie (Toronto: University of Toronto Press and Centre of Criminology, 1998), pp. 135-182. ‘Recent Publications in Canadian Legal History’ Canadian Historical Review, Vol 78, 1997, pp. 236-257. ‘Crime and Punishment in the Dominion of the North: Canada from New France to the Present’ in Clive Emsley and Louis A. Knafla, eds., Crime History and Histories of Crime: Studies in the Historiography of Crime and Criminal Justice (Greenwood, Ct.: Westview Press, 1996), pp. 163-199. ‘Securing Obedience to Necessary Laws: The Criminal Law in Eighteenth Century Nova Scotia’ Nova Scotia Historical Review, Vol 12, 1992, pp. 87-124. 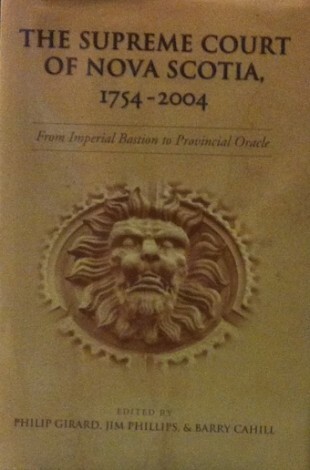 ‘The Operation of the Royal Pardon in Nova Scotia, 1749-1815′ University of Toronto Law Journal, Vol 42, 1992, pp. 401- 449. ‘Parliament and Southern India, 1781-83: The Secret Committee of Inquiry and the Prosecution of Sir Thomas Rumbold’ Parliamentary History, Vol 8, 1988, pp. 81-97.